DogsBite.org recorded 34 fatal dog attacks in 2015. Pit bulls contributed to 82% (28) of these deaths, the highest fatality count recorded for the breed and a 56% (18) rise from 2005. 82% also marks the highest percentage of deaths attributed to pit bulls in a single year in our 11-years of data collection (2005 to 2015). The last year the CDC collected "breed" data about fatal human dog attacks was 1998, 18-years ago. Since this time, pit bulls have killed 290 U.S. citizens. 34 U.S. dog bite-related fatalities occurred in 2015. Despite being regulated in Military Housing areas and over 700 U.S. cities, pit bulls contributed to 82% (28) of these deaths. Pit bulls make up about 6.6% of the total U.S. dog population. This year's release includes statistics from our 11-year data set. From Jan. 1, 2005 to Dec. 31, 2015, canines killed 360 Americans. 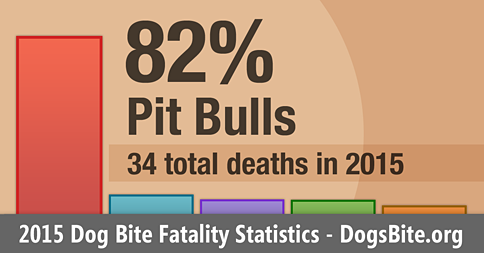 Pit bulls contributed to 64% (232) of these deaths. Combined, pit bulls (232) and rottweilers (41) contributed to 76% of attacks resulting in death. Charts and graphics are available for download on the 2015 Dog Bite Fatalities page. In the discussion notes, we examine 2015 trends and a chart that breaks down the 11-years. 2015 marks the highest number of deaths attributed to pit bulls (28) in a single year. It also marks the highest percentage of deaths attributed to pit bulls, 82%, in our 11-years of data collection (2005 to 2015). To visualize the degree to which pit bulls dominate fatalities, we created a chart that maps each year of our data. In 2005, pit bulls were estimated to be 5% of the total U.S. dog population. Today it is 6.6%.1 As this population rises, deaths inflicted by pit bulls rises with it. Included in the chart is the combination of pit bulls and rottweilers (orange line). It shows that these two dog breeds overwhelmingly dominate attacks resulting in death. In fact, if these two breeds were excluded, annual fatal dog attack statics would reflect about 8 deaths per year, close to the mid 1970s, when both breeds had scant population numbers. For the pre-pit bull, rottweiler years, view: Human Deaths Induced by Dog Bites, United States, 1974-75, by Winkler et al. In the 40-years since that study, the total U.S. human population has increased by over 100 million and the estimated U.S. dog population by 20 million.2 Animal control programs, local ordinances and enforcement, spay and neuter rates and dog ownership education have improved vastly since. (See: 1975 Special Report on Controlling America's Pet Population, by the HSUS). Not to mention the exponential growth in child safety, safety education and protocols since 1975. None of these societal advances, however, are enough to stop pit bulls and rottweilers from killing. In 2015, fatal attacks inflicted by non-family dogs rose to 59%, up from the 10-year average of 47% (2005 to 2014). This percentage has been steadily rising over the years, but 59% is the highest percentage in our 11-year data set. Non-family dogs include the victim having no previous relationship with the dog or a very limited one, but are also determined on a case-by-case basis. In 2015, this included a rottweiler that was adopted out and killed its new owner 3-hours later. 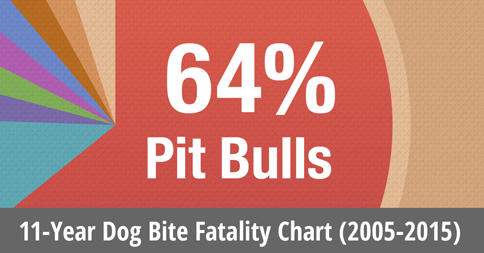 Of the 28 deaths inflicted by pit bulls in 2015, 61% were carried out by non-family pit bulls. This is up 30% from the breed's 10-year average of 47%; the same number as the "all breeds combined" non-family dog average. So in 2015, pit bulls were the chief factor in reversing the longstanding metric of family dogs being the majority offender in all fatal dog attacks. Many of the non-family pit bull fatalities in 2015 were victims who were visiting the dog owner's home or walking near it. In 2015, 9% (3) of all fatal attacks involved dangerous dog breeds that were adopted out by county shelter facilities or a rescue. In June, the Asheville Humane Society -- who contracts to operate the Buncombe County, NC shelter -- adopted out a pit bull after it passed a SAFER temperament test, which killed a little boy 3-weeks later. Modern "state-of-the-art" temperament assessment tests, while better than no evaluation test at all, still cannot measure unpredictable aggression. In November, after a 3-day hold, Jackson-Madison County Rabies Control adopted out a rottweiler to 57-year old Anthony Riggs, an experienced dog handler, who was brutally killed by the animal 3-hours later. Stunningly, Rabies Control has no evaluation policy or assessment testing at all. In both cases, the dogs were picked up as strays with an unknown history. Both cases also reflect the "reality" of modern sheltering -- adopt out dogs at all costs to keep euthanasia rates low. 5-months after 6-year old Joshua Strother was killed by a young pit bull that passed the ASPCA's SAFER test, the ASPCA ceased the certification process. Animals 24-7 commented then: "The abrupt end to certifying SAFER test-givers appears to be meant to reduce potential liability to the ASPCA, even as the ASPCA continues promoting the test itself and pushing adoptions of pit bulls." Since 2007, U.S. shelter dogs have killed at least 42 people, according to the group. The ASPCA now also recommends against the "food guarding" portion of their own test, one of the most basic safety tests of all, to ensure that fewer dogs are euthanized. "Stop euthanizing food guarders," states their website, and instead, "send them home." Some of the commenters are unconvinced. "I would hesitate to drop it from the evaluations because I think it is an important piece for new adopters to know," writes Pam. An adopter with young children would surely agree. In 2015, two cases involved unknown dog breeds. In 5 cases (15% of all fatalities), the breeds were misreported or unreported, requiring extensive research efforts by DogsBite.org to obtain this information. Each of these cases involved insufficient reporting by local law enforcement or the media. This does not even include the mauling death of 7-year old Gaege Ramirez in Texas, where the Comal County Sheriff's Office simply told the media, "none of the dogs were pit bulls." Insufficient reporting by local law enforcement and media organizations is unacceptable today. Modern communication, technology and information is simply too easy and accessible. We understand the limitations on Indian Reservations and why some small jurisdictions limit the media after a devastating fatal dog mauling. Yet, dog attacks resulting in the death of a person are a community issue. The public deserves to know the basic details for health and safety reasons. 11-years of fatal dog bite statistics and data is enough to evaluate the "breed-specific" issue. Pit bulls dramatically dominate attacks resulting in death. With the addition of rottweilers, these two breeds accounted for 76% of these deaths. When mastiff-type guard dogs and war dogs are added -- the types used to create "baiting" bull breeds and fighting breeds3 -- this small group of breeds is responsible for 84% of all deaths. Breed-specific laws are more needed now than ever. 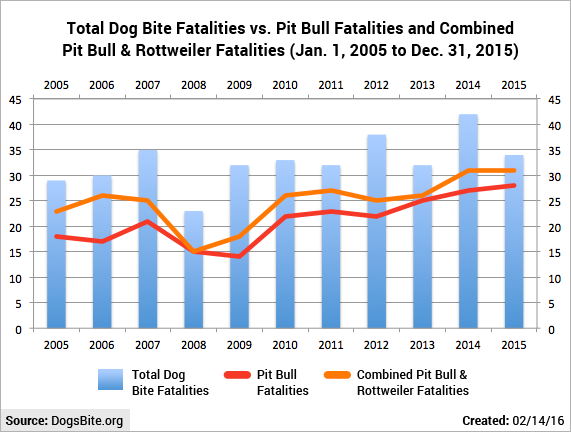 Our call to action this year is to use our statistics in correspondence with local and state officials, especially the chart showing 11-years broken down by year that depicts how heavily two breeds, pit bulls and rottweilers, dominate fatal attacks. As the CDC study stated 16-years ago, back when the percentage of deaths inflicted by the two breeds was lower than today, "there appears to be a breed-specific problem with fatalities." Our data shows this remains true and has worsened. 1Most popular breed in U.S. ain’t nothing but a hound dog, by Merritt Clifton, Animals 24-7, July 20, 2015 (www.animals24-7.org). 2U.S. human population 1975, U.S. Census Bureau and the estimated dog population in the U.S. during the late 70s noted in: Traumatic Deaths from Dog Attacks In the United States, by Pickney LE. Kennedy LA, Pediatrics, 1982;691:193-196. 3This grouping includes: American bulldogs, mastiffs and bullmastiffs, presa canarios and cane corsos. 4Just prior to publishing we learned that Washington State Rep. Appleton's bill failed for the third year in a row. But the increasing numbers of breeders (aided by advocacy marketing and anti-regulation efforts) keep on breeding and making money; the dog fighters keep on breeding and fighting and making money; the next-level pit bull dealers (aka "rescues" and "shelters") keep making money. It all gets worse every day. So the latest issue of "Rodale's Organic Life" magazine shows a very young child climbing up onto a couch where a full-grown pit bull is already sitting. Even the most mainstream media are becoming more pushy with pairing children with fighting breeds and presenting it as "heartwarming." It is no wonder why attacks are skyrocketing. This is the only information/imagery many potential dog owners are encountering. My friend Tina Pounds recently lost much of her lower face because of a pit bull attack in Baton Rouge, Louisiana. She and her little grandson were walking across the street to a neighbor's pizza party when the child was attacked by a loose pit bull. Tina got between the child and the dog and saved her grandson but had her lower lip and much of the bottom of her face bitten off. Please donate what you can to Tina's GoFundMe for her mounting medical bills and keep her in your prayers.